What’s happening to one Georgia woman sounds like something out of a horror movie. Pieces of dead bone push up out of her gums, causing pain and making it difficult for her to eat. It’s a condition called dead jaw syndrome or osteonecrosis of the jaw (ONJ). Parts of the jawbone become exposed, starve from lack of blood and die. When the symptoms started, C.H. went to her regular dentist, who then consulted with an oral surgeon. At age 50, her doctor had prescribed Fosamax to treat osteopenia — a mild form of bone loss. Unlike osteoporosis, osteopenia doesn’t greatly increase the risk of bone fracture. Fosamax works by slowing down the rate at which the body breaks down old bone. C.H. had never heard of any warnings about the drug’s side effects. She thought it would protect her from fractures. But, she has had more than her fair share of experience with Fosamax side effects. Before it caused bones to protrude in her mouth, it led to two surgeries for a broken femur. Now, she has a metal rod in her leg and continues to suffer from chronic pain. Thirteen years after C.H. began taking Fosamax, she mildly twisted her leg as she was walking around the house. Her femur spontaneously fractured and she fell. Prior to this incident, she had never broken any bones. That was the first that C.H. heard about the connection between the two. When the bone wasn’t healing from the first surgery, C.H. had to undergo a second surgery. For two years after, she was forced to take strong medication to manage her pain. She filed a Fosamax lawsuit for the femur break. She cautions against using the drug. Fosamax “completely disrupted three years of my life,” she said. In February 2018, dead bone was coming up through C.H.’s gums. Doctors told her the body was rejecting the dead bone. Her dentist diagnosed her with ONJ. 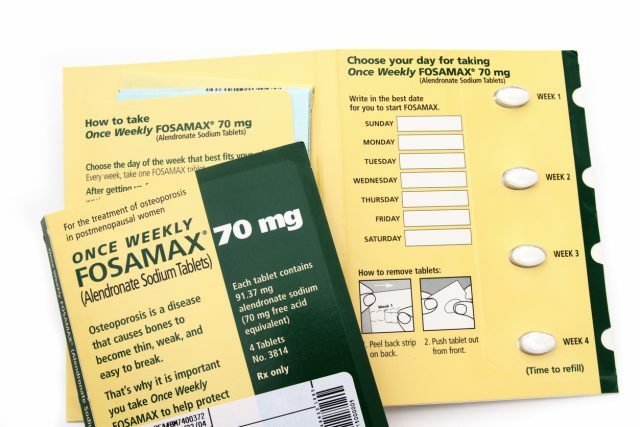 The condition is a reported side effect of Fosamax, according to the drug’s label. C.H. has no treatment options for ONJ except oral surgery to continue removing the dead bone when it protrudes through her gums. C.H. and her husband had a successful retail business before she began suffering side effects of Fosamax. After she broke her leg, she knew there was no way she could continue running the business. They sold the business and moved to Georgia to be closer to family. Looking back on it now, C.H. tries to make light of how the drug changed her life. “It’s not much fun to try and enter a federal building anymore and explain, ‘No, it’s not my cell phone or a bomb — it’s the rod in my leg,’” she chuckled.